• 17 million phone calls to verify information. Every business is called one to four times a year. Online, Internet, and offline databases may be further classified as bibliographic, numeric, full-text. directory, or special-purpose databases. Bibliographic databases are composed of citations to articles in journals, magazines, newspapers, marketing research studies, technical reports, government documents, and the like.20 They often provide summaries or abstracts of the material cited. Examples of bibliographic databases include ABlllnform and the Prcdicasts Terminal System. Numeric databases contain numerical and statistical information, such as survey and time-series data. Economic and industry data lend themselves to time-series presentations.which arc developed when the same variables are measured over time. Such data are particularly relevant for assessing market potential. making sales forecasts. or setting sales quotas. The American Statistics Index (ASI) provides abstracts and indexes of federal government statistical publications. Global Financial Data provides historical data on securities, dividends. and exchange rates. Full-text databases contain the complete text of the source documents comprising the database. Text Information Systems, Inc., provides electronic full-text delivery and search capabilities for a number of newspapers (e.g., Washington Post, Boston Globe, Miami Herald). The LexisNexis service provides full-text access to hundreds of business databases, including selected newspapers, periodicals, company annual reports, and investment firm reports. Directory databases provide information on individuals organizations and services. 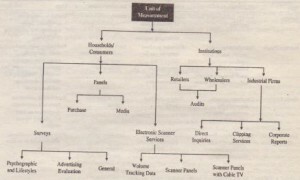 Economic Information Systems Inc through its database Non manufacturing Establishments, provides information on location, headquarters, name, percentage of industry sales, industry classification., and employment size class for about 200,000 non manufacturing establishments that employ 20 or more people. As another example, the national electronic Yellow Pages directories of manufacturers, wholesalers, retailers, professionals, and service organizations provide the names, addresses, and North American Industrial Classification codes of numerous organizations. panels, or electronic scanner services. Information obtained through surveys consists of values and lifestyles, advertising evaluation, or general information related to preferences. purchase, consumption, and other aspects of behavior. Panels emphasize information on purchases or media consumption. Electronic scanner services might provide scanner data only, scanner data linked to panels, or scanner data linked to panels and (cable) TV. 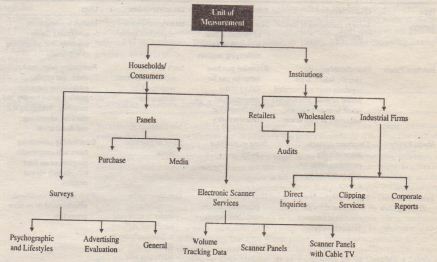 When institutions are the unit of measurement, the data may be obtained from retailers, wholesalers, or industrial firms. 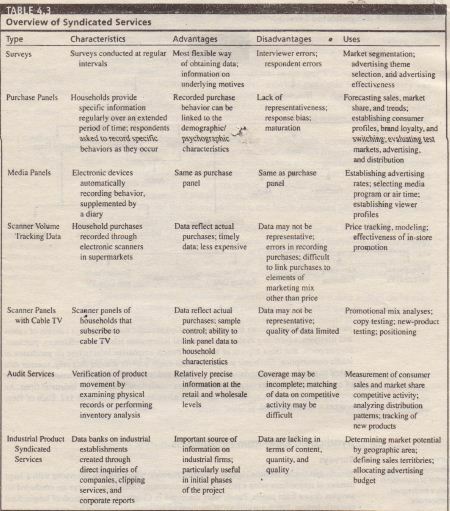 An overview of the various syndicated sources is given in Table 4.3 on page 112. Each of these sources will be discussed. Various syndicated services regularly conduct surveys, which involve interviews with a large number of respondents using a predesigned questionnaire. Often these surveys are conducted on samples drawn from panels. Panels were discussed in Chapter 3 in the context of longitudinal research designs. Panels are samples of respondents who provide specified information at regular intervals over an extended period of time. These respondents may be organizations, households. or individuals, although household panels are most common. Comprehensive demographic, lifestyle, and product-ownership data are collected only once as each respondent is admitted into the panel. The panel is used as a respondent pool from which the research organization can draw either representative or targeted samples based on the relevant background characteristics of the panel members. Response rates to panel surveys, including mail panels. are substantially improved over the random sampling process because of the commitment panel members make to participate in surveys.